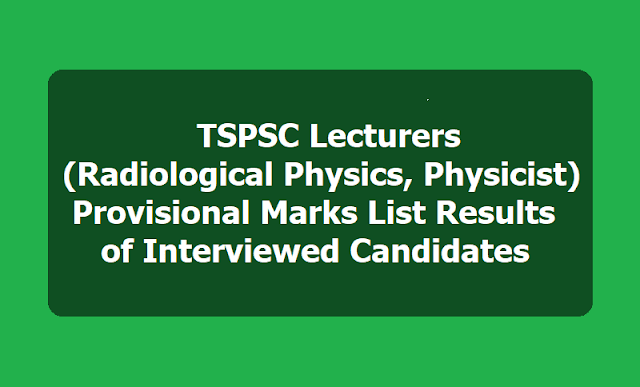 TSPSC Lecturers Recruitment Hall tickets, , Preliminary Anwer key, Main Anser Key, Results. TSPSC Lecturers Recruitment 2017 in in DME Telangana: Telangana State Public Service Commission(TSPSC) has published the Lecturers in Radiological Physics and Physicist Recruitment 2017 notification on 15-08-2017(notification 43/2017 dt.15.08.2017) and Applications are invited Online from qualified candidates through the proforma Application to be made available on Commission’s WEBSITE (www.tspsc.gov.in) to the post of Lecturers in Radiological Physics and Physicist in Director of Medical Education (HM&FW Department). The Commission published the list of provisionally selected candidates for the post of LECTURERS IN RADIOLOGICAL PHYSICS AND PHYSICIST IN DME (HM&FW DEPARTMENT) on the basis of CBRT Examination held on 23/10/2017 & 24/10/2017, verification of certificates held on 22/05/2018 and 09/11/2018 and Oral Test (Interview) held on 01/02/2019. The list of provisionally selected candidates is available on the Commission’s website (www.tspsc.gov.in). TSPSC has hereby notified that on the basis of the CBRT examination held on 23/10/2017 FN and 24/10/2017 F.N, verification of certificates held on 22/05/2018,09/11/2018 and Oral test (Interview) held on 01-02-2019 at TSPSC Office, Hyderabad to the post of LECTURERS IN RADIOLOGICAL PHYSICS AND PHYSICIST IN DIRECTOR OF MEDICAL EDUCATION ( HM&FW DEPARTMENT), the following Hall Ticket numbers have been provisionally selected for appointment to the post of LECTURERS IN RADIOLOGICAL PHYSICS AND PHYSICIST IN DIRECTOR OF MEDICAL EDUCATION (HM&FW DEPARTMENT) vide Commission’s Notification No.43/2017, Dt: 15-08-2017, subject to outcome of Court Cases, if any. The selection is published here subject to the following conditions. (Number of Candidates: 05) If it comes to the notice of the Commission later that any candidate furnished false information or the selection is not in order due to any act of omission or commission of any candidate, then her/his provisional selection is liable to be cancelled at any stage and they will forfeit all consequential benefits including that of selection, besides that, the Commission reserves the right to take any action as it deems fit in the circumstances of the case, in terms of the provisions as notified in TSPSC Rules of Procedure published in Telangana State Gazette No. 60., Dt: 28/12/2015. The Commission published the List of Registered Numbers of provisionally admitted candidates for Interviews (Oral Tests) for the above post on the basis of CBRT Examination held on 23/10/2017 & 24/10/2017. The Interviews (Oral Tests) will be held in the office of TSPSC at Prathibha Bhavan, Nampally, Hyderabad on 01/02/2019, 10:00 A.M onwards. Further it is informed that the List of candidates (Hall Ticket Numbers) and further details are available in the Commission’s Website www.tspsc.gov.in. 1. TSPSC has notified that on the basis of the CBRT Examination held on 23/10/2017 & 24/10/2017, verification of certificates held on 22/05/2018 and 09/11/2018 to the posts of Lecturers in the Radiological Physics and Physicist in Director of Medical Education (HM & FW Department) the candidates with the following Hall Ticket Numbers have been provisionally admitted for the ORAL TEST (Interview). 2. The candidates who have qualified for Oral Test (Interview) are required to attend at TSPSC Office along with Hall Ticket, Original Certificates, and Three (3) passport photos on the relevant date and time as mentioned in the following schedule. 3. If on further verification, it is found that any candidate is not eligible with reference to the particulars furnished by him/her in the Application Form / Check List / Certificates, the results of such candidate / candidates shall be cancelled at any stage of selection process. TSPSC has conducted the written examination for above Recruitment. The Final Keys of this Examination will be available on TSPSC website from 05-02-2018. No further Objections will be entertained on Final Keys. TSPSC Civil Assistant Surgeons (Specialists), DA, Tutors, Lecturer in Radiological Physics and Physicist, Civil Assistant Surgeons and Asst, Physiotherapist Vide Notification nos. 40/2017. 41/2017, 42/2017. 43/2017, 44/2017 and 45/2017 Preliminary Answer Keys: TSPSC has conducted written examination for above notifications No.40 to 45/2017 on 23-10-2017 and 24-20-2017 FN an AN. The preliminary keys of these exams will be available on TSPSC website from 30-11-2017. The objections on the preliminary keys will be accepted online on TSPSC Website from 02-11-2017 to 08-11-2017. Candidates are advised to note thr above dates and submit their objections through the link provided. Objections received beyond 08/11/2017 will not be considered at any cost. The candidates are instructed to submit their objections only in English and only as per the order of question appearing on the screen with the questions numbers allotted by TSPSC. For further details please visit TSPSC Website. TSPSC.GOV.IN. TSPSC has conducted Written Examination for the above notifications on 23/10/2017 & 24/10/2017 FN & AN. The last date of receiving objections on the Preliminary Keys which was declared as 08/11/2017 is now extended upto 19/11/2017. Candidates are advised to note the above date and submit their objections through the link provided. Objections received beyond 15/11/2017 will not be considered. The candidates are instructed to submit their objections only in English and only as per the order of questions appearing on the screen with the question numbers allotted by TSPSC. or Nuclear Physics of a University in India established or incorporated by or under a Central Act, Provincial Act or a State Act or an Institution recognized by the University Grants Commission or an equivalent qualification. (ii) Must have passed one year Postgraduate Training Course in Hospital Physics and Radiological Physics from Baba Atomic Research Centre (BARC). Note: If no suitable and qualified candidate is available with the qualification and Experience as prescribed, a candidate with First Class M.Sc. in Physics or Nuclear Physics may be appointed by direct recruitment and shall be deputed for one year post graduate Training Course in Hospital Physics and Radiological Physics to Baba Atomic Research Centre (BARC). The candidates who applied for the posts of Lecturers In Radiological Physics And Physicist (43/2017) are requested to note the examination dates for various posts as mentioned herewith.